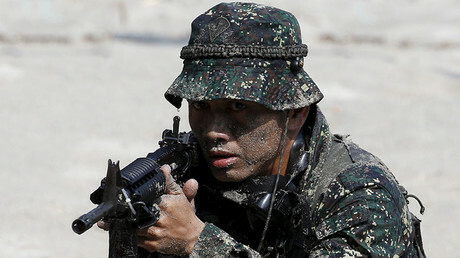 Philippines President Rodrigo Duterte has said he would send rogue cops to violence-prone southern areas of the country, where Islamic militants roam, as punishment. The move follows his disbanding of the anti-drugs force after massive evidence of police corruption. On Tuesday, Duterte gathered up 400 police officers on the premises of the presidential palace, all of them under investigation for all manner of transgressions. Calling them things like “idiots” and “sons of b*tches,” the leader at one point challenged them to a shootout, according to Reuters. “I will send you to Basilan [in the southern Philippines], live there for two years. If you get out alive, you can return here. If you die there, I will tell the police not to spend anything to bring you back here but to bury you there,” Duterte warned the officers. Basilan is a stronghold of the home-grown, Islamic State-linked terrorists the Abu Sayyaf, notorious for beheading those they hold captive. Until several days ago, the president’s narcotics units were the most feared thing in the Philippines, and the subject of much controversy for the alleged extrajudicial killings being carried out in Duterte’s war on drugs. However, the recent murder of a South Korean businessmen by rogue officers changed all that, and led to a massive about-face for Duterte, who disbanded the entire narcotics unit and brought in the military to deal with the problem. The president then issued statements saying the police force was indeed full of corrupt officers, and needed a clean-up. 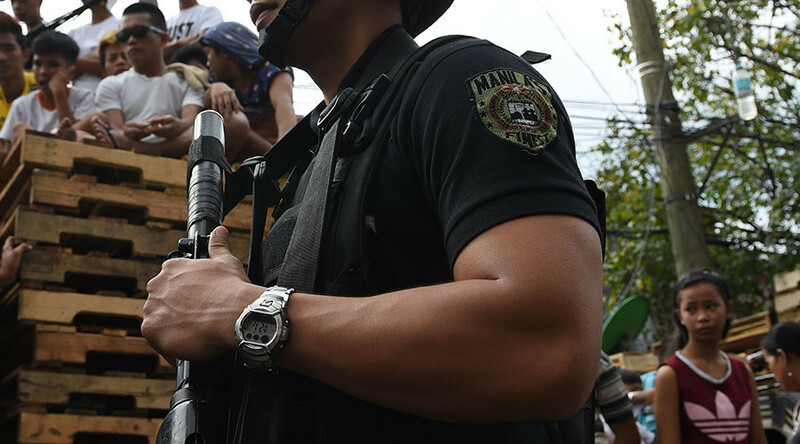 Saying the police force was “corrupt to the core,” Duterte promised severe punishment for the implicated officers, and vowed to fight corruption within its ranks. On Tuesday he also offered those police officers who don’t want to go to Basilan the chance to quit altogether, but warned them not to relapse to their dishonest ways. “Find a clean livelihood. I will keep a battalion to keep track of your movements because it has been the sad experience of this country that the most vicious criminals, most are ex-police or ex-military men,” the Philippine leader continued. Although the president has disbanded the narcotics force, the country’s Drug Enforcement Agency will now work alongside the military in both pursuing drug lords and hunting down corrupt cops. The leader gave no indication of a slowdown in his war on drugs. Since coming to power in June last year, Duterte’s anti-drug campaign is said to have claimed more than 7,000 lives, a portion dying in police detention. Criticism has been leveled at the government far and wide, including from the administration of former US President Barack Obama, whose claims of human rights abuses were not taken kindly by the Philippine president. Duterte ended up spurning Washington and making a series of bilateral agreements with China. The president has insisted repeatedly that his country is plagued by too many problems to take note of external criticism, and that he should be allowed to do his job.